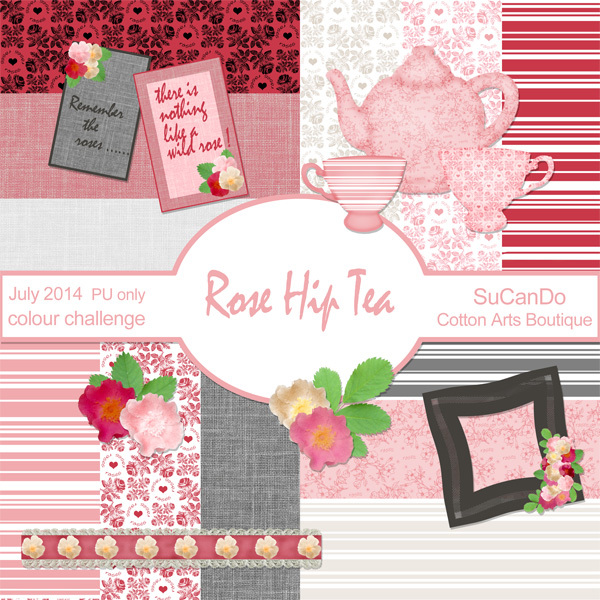 The colour challenge at the Scrapbooking Studio for July was a choice of colours for a monotone theme. I chose to use the wild roses from my wild flower garden. And if we have wild roses we have rose hips which make a beautiful tea, so pull up a chair, relax and have a cup of tea with me. The tea pot and cups were done with the templates from the Pixel Scrappers site. I would love to sit with you and have a cup of tea! LOL This is darling! Thank you! I think there are three “Su’s” in the digi-design community now. Su from StarSunflowerStudios uses an umlaut over the ‘u’. Then, me, and now you! Yay!